This new and innovative technology allows me to fight blepharitis directly by using the handpiece to remove the bacteria and biofilm buildup along the eyelids and eyelashes that are the root of the problem. The eyes are the windows that one uses to gaze upon the world. However, there are a myriad of afflictions that can impact the eyes, not to mention the issue of just aging. A lot of individuals suffer from various eye problems, such as cataracts and dry eyes. The American Academy of Ophthalmology notes that 24.4 million Americans over the age of 39 have cataracts and that 3.2 million women and 1.5 million men over the age of 49 suffer from dry eyes. (1) Experienced oculofacial plastic surgeons, such as Dr. John R. Burroughs of Colorado Springs, know that dry eyes and blepharitis are among the most common problems affecting the eyes and believes the rates are even higher in Colorado because our arid, high altitude environment. Blepharitis is a painful and chronic condition that can worsen over time if left untreated. Aesthetic plastic surgeons, such as Dr. John R. Burroughs of Colorado Springs, regularly see patients with blepharitis suffering effects such as itchy eyelids, sensitivity to light, red and swollen eyelids, watery eyes, burning sensation in the eyes, flaky or scaly skin, and crusting of mucus around the eyes. Blepharitis is very common. A study in 2009 showed that ophthalmologists noted that 37% of their patients had the condition and that optometrists reported 47% of their patients were suffering from it as well. (3) Not only does the occurrence of blepharitis lead to chronic eye discomfort, but there are other negative consequences as well. A study published in 2013 showed that individuals with blepharitis had significantly higher risk of anxiety and depression. (4) DEBS patients can also suffer painful corneal ulcers that can cause scarring of their corneas and difficult to eradicate red, swollen eyes. While there is no cure for blepharitis, there are treatment options. Experienced oculofacial plastic surgeon specialists, such as Dr. John R. Burroughs (Springs Aesthetics) of Colorado Springs, had long been resigned to offering treatments such as warm compresses, antibiotics, eye drops, specialized lid scrubs (Avenova and Ocusoft), and improved hygiene for the affected areas. However, a new treatment option, BlephEx, has arrived and is offering an exciting, innovative method for treating blepharitis and keeping the condition under control with regular treatments. BlephEx is a procedure that uses a patented handpiece, under the supervision of a medical professional, that uses a medical grade micro-sponge to carefully and precisely spin along the edge of the eyelids and lashes, which exfoliates the eyelids and removes the troublesome debris and bacteria. BlephEx is a novel doctor prescribed procedure for dry eye and blepharitis as it actually removes the causes of the inflammation helping the eyes feel better. Lipoflow, another procedure for posterior blepharitis, has had limited success owing to its high cost and that only addresses the posterior form of blepharitis and not the anterior form or the demodex issues that many patients suffer from. This new treatment option only takes a few minutes to complete and is relatively pain-free. Dr. John R. Burroughs of Colorado Springs notes, "Many of the patients that I see on a daily basis suffer from dry eyes and blepharitis as these two conditions commonly occur together and at a very high concentration in the dry, arid climate of Colorado. The sad reality is that there is no cure for Dry Eye/Blepharitis Syndrome (DEBS), and our treatments were not able to actually impact the root causes. However, this has dramatically changed with the introduction of BlephEx to the market. This new and innovative technology allows me to fight blepharitis directly by using the handpiece to remove the bacteria and biofilm buildup along the eyelids and eyelashes that are the root of the problem. In addition to bacteria, many patients acquire Demodex (a mite) infestations of their eyelashes and lid margin, further contributing to their dry eye and blepharitis problems. Traditionally, this mite infestation has been very difficult to completely treat, requiring specialized lid scrubs that could take months to improve but not necessarily eradicate. Because BlephEx utilizes a specialized soap that is effective for the bacteria as well as the mites, through its mechanical cleaning and debridement of the biofilm buildup, it allows for a more thorough approach that lasts for up to six months. In the past, aesthetic eyelid plastic surgeons, such as Dr. John R. Burroughs (Springs Aesthetics) of Colorado Springs, could only offer minimal treatments for blepharitis and dry eyes. Now the tide has turned as medical professionals can now offer their patients the new BlephEx procedure, which removes the buildup of bacteria and biofilm that causes the inflammation in the first place. While BlephEx does not cure DEBS, it does ensure that the effects are kept at bay through regular treatments that only take a few minutes. Though the BlephEx treatments are not covered by insurance, it is reasonably priced and can reduce, if not eliminate, the expensive need for over-the-counter and prescribed antibiotics and lubrication drops. The eyes are precious jewels and need to be taken care of, and BlephEx offers a novel and very effective new means of ocular health maintenance and protection. 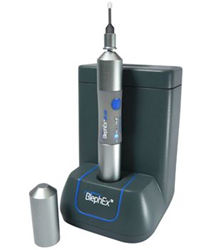 Just as a thorough 6-12 month professional dental teeth cleaning is essential for oral health, BlephEx is becoming an essential eyelid cleaning for patients suffering from DEBS. Additionally, as an aesthetic eyelid and facial plastic surgeon, Dr. Burroughs reminds his patients that the eyes are the central focus of one’s appearance when talking to others. Having bright, healthy appearing eyes without chronic redness, discharge, and eyelid inflammation is a part of having beautiful, as well as healthy, eyes.